… “look” being the key word. Today, we got a sneak peek of the sun and the spring to come. But it’s just not the same when you still have to put on ten layers of clothes, huge scarfs and woollen socks. But for some reason, I still really like this time of year. You are so hungry for the sun after a dark winter and the cold gets just a little easier to manage when you feel the warmth of the sun. 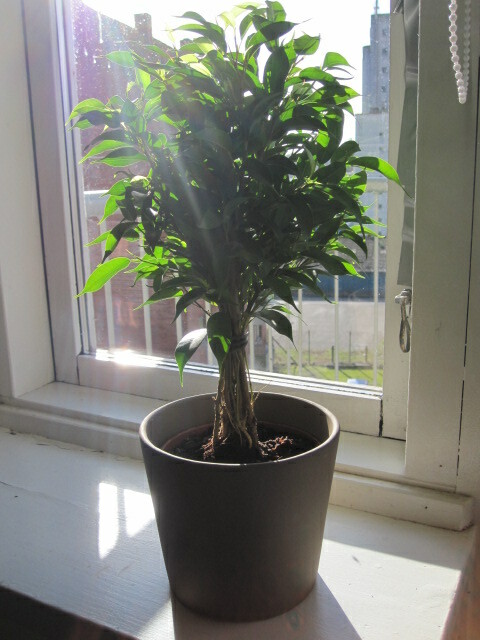 I’m celebrating the beginning of spring (at least calender-wise) by getting my first ever real plant, not those bamboo sticks that you need to water every 3rd month, not fake flowers, but actual greenery. On sunday my father and boyfriend got so annoyed with me saying for forever how I really wanted a plant, but we’ve never really had the space for it before, so when in IKEA they got me this plant! I’m not sure which kind it is, but I love it! And today it got a little taste of the sun. How are you spending the first few days of spring?